Home > Blog > Uncategorized > What Exactly Is Radiolabeling? In the simplest possible terms, radiolabeling lets researchers “label” molecules with radioactive isotopes. By replacing carbon atoms within a molecule with carbon isotopes (such as C14), these molecules can be more easily tracked using imaging equipment. This process can be done in several ways and with a variety of radiolabeled compounds. Radiolabeling, a form of isotopic labeling, is performed so that scientists can follow the journey of a molecule. Using this technique, the isotope in question can be tracked as it moves through microscopic cells or throughout chemical reactions. 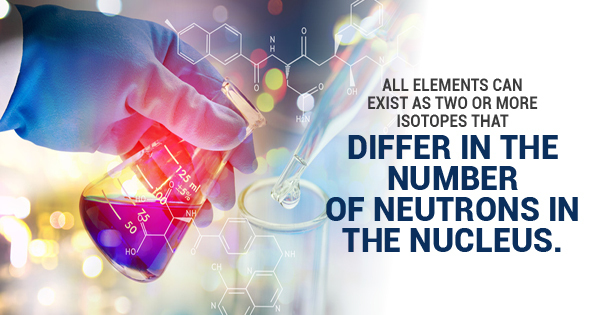 All elements can exist as at least two isotopes with different numbers of neutrons in the nucleus. While these isotopes are easier for researchers to trace, they don’t change the behavior of the molecule they are studying. Thus, this technique is instrumental in the development and testing of drugs, in both discovery and clinical study phases. There are a variety of compounds that can be used to radiolabel molecules. Some of the most common radiolabeled compounds used today include carbon-14 (14C labeling), tritium (3H), and sulfur-35 (35S). How Is Radiolabeling Used Today? There are several different methods of isotopic labeling that can be used depending on the application. Because radiolabeling lets researchers reliably track microscopic molecules as they pass through incredibly large and complex systems, this technique is used in a variety of disciplines. As a result, radiolabeled compounds may need to be produced by specialty chemists for specific experiments and applications. What are some common examples of radiolabeling in action? Oceanographers often use radiolabeling to track the movement of particles within large bodies of water. Most often, radium isotopes are used to track water circulation within bays, rivers, and groundwater sources. In medicine, radiolabeling can be used to help physicians make more accurate diagnoses. Patients are given radiolabeled pharmaceuticals, either orally or intravenously. Once the isotopes have been introduced into the body, imaging techniques such as MRI or CT scanning can be used to capture precise images of body parts. By revealing the innermost workings of organs and cells, this technique has helped save countless lives. Finally, in drug research and development, radiolabeling is used to study the metabolism of test drugs. Radiolabeled compounds give chemists a clear picture as drugs are metabolized and cleared by the body. By helping scientists create clear pictures early on in this research process, scientists can bring new drugs to market much more quickly. Radiolabeling is an important process that allows scientists to develop and test new materials. If you’re interested in learning more about radiolabeling or are in need of radiolabeling compounds, contact Moravek today. ← What Kind of Fume Hoods Are Available to Today’s Labs?